2 Houses perched against natures landscape allowing privacy and unrestricted views, bringing the outdoors indoors. Perfect for 2 families “A rare find”. Main residence – 4 Bedrooms, master/ensuite, Walk-in-Robe, direct access to the large fully screened patio. Pure white kitchen highlighting new appliances. Theatre room/living room/family room. Residence 2 – Stunning kitchen, granite benchtops, 2 bedrooms, main connected to the 2-way bathroom, 2 living areas, fully screened patio overlooking the massive yard and Mt Stuart. 2 Double remote garages, side access for boat/caravan, solar, bore. A lifestyle solution for extended/blended families. Original Owner.2 Houses perched against natures landscape allowing privacy and unrestricted views, bringing the outdoors indoors. Perfect for 2 families “A rare find”. Main residence – 4 Bedrooms, master/ensuite, Walk-in-Robe, direct access to the large fully screened patio. Pure white kitchen highlighting new appliances. Theatre room/living room/family room. Residence 2 – Stunning kitchen, granite benchtops, 2 bedrooms, main connected to the 2-way bathroom, 2 living areas, fully screened patio overlooking the massive yard and Mt Stuart. 2 Double remote garages, side access for boat/caravan, solar, bore. A lifestyle solution for extended/blended families. Original Owner. Large fully landscaped areas and garden beds surround the home with over 30 varieties of palms just to name a few of Australia’s natural Fauna. 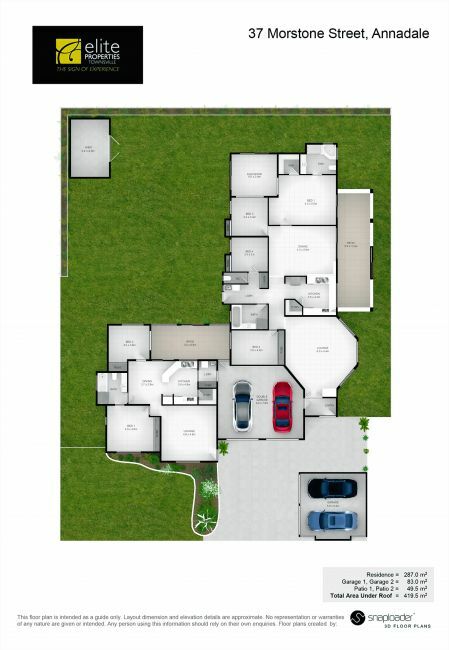 2 double garages are included, one double garage divides one home from the other. The other double garage adds feature to the streetscape and can double up as a home office/storage or double garage come workshop. Fully integrated wall to wall kitchen cupboards are installed in said garage. Double gates on the LHS of the property allow easy access to the large rear yard which also has a 3x3 colorbond shed installed. The home has been fully serviced and nothing has been spared on it’s presentation. New tapware & accessories have also been installed. 3 of the 4 bedrooms can fit double beds easily and bedroom 4 is also a good size. All bedrooms have integrated wardrobes and airconditioning. The main bedroom & family room have nearly new split systems providing reliable cool air on demand. The laundry in the main home is large and spacious with easy access to the rear yard.• The home has been freshly painted and is tastefully done with a touch of charm. The home has been insulated via ceiling batts which creates a pleasant all year round temperature in the home.• The entry porch is a delight, spacious with feature wall panelling and dado rails. Feature entry floor tiles greet you as you enter. A fully integrated security system is installed with LED keypad located in entry porch. Home 2 has been freshly repainted and has been upgraded as per home 1 – new light fittings, smoke detectors and bathroom fittings. Home 2 has a user friendly granite top kitchen and splashback with near new appliances. A large walk-in pantry and integrated laundry room with linen cupboard finish off this well designed area. The kitchen and dining area have easy access to fully screened patio area. The laundry is located for easy access to rear yard and clothes line. A large master bedroom with its own 2-way bathroom help make this home a pleasure to live in. The master bedroom has a large built-in wardrobe. A feature front door with side-lite greet you at entry. Once you step in to this home you are met with a large and spacious airconditioned lounge room. Bedroom 2 has access to the rear patio and is more that big enough for a double bed suite. A large built-in robe is also fitted. A large exposed aggregate driveway allows for multi-car parking. The letterbox is custom built with easy access from the driveway. This home/homes is one of a kind and only comes once in a lifetime. Large Parcel of land with unsurpassed views of natural landscaping and Mt Stuart. Enough room in rear yard for large swimming pool. A- All the facilities close by like Schools, Hospital, University (James Cook) Transport and Shopping Centres. A - They can’t believe the size of the property, it’s deceiving from the front. All the Natural Fauna and wildlife we get.